I'm really enjoying sitting and stitching by hand at the moment. I have a wonderful audiobook, Eleanor Oliphant is Completely Fine by Gail Honeyman, that I've been listening to on Audible and I can hardly bear for it to end. It's a debut novel and the best book I've 'read' in ages. The narrators in audiobooks can make or break a good story and Catherine McCarron is outstanding, she slips into the various voices so easily. I've wanted to concentrate on every word so embroidery has been the perfect past time. 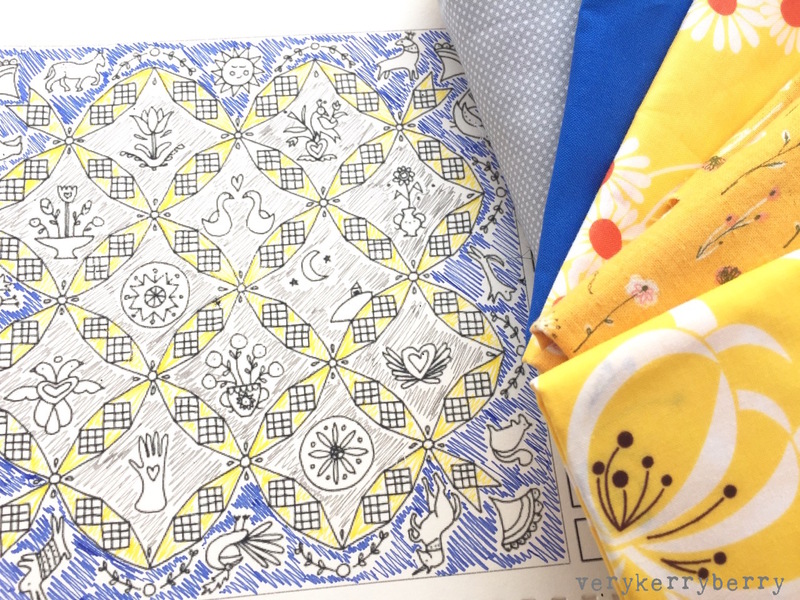 The screen printed design is from my Jessie Chorley Friendship Quilt kit. 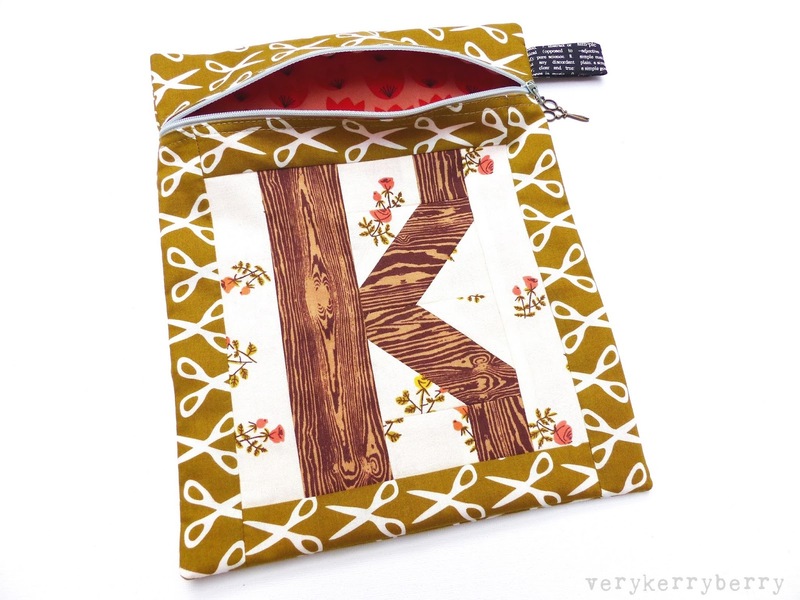 There are six different designs each measuring around 4" square. I find holding these without a hoop make my hands sore, so I created a temporary fabric frame so they will fit in a small hoop- this one is 6" diameter. It's easy to do. I used scrap cotton fabric from a dress toile and cut it large enough to fit my hoop. 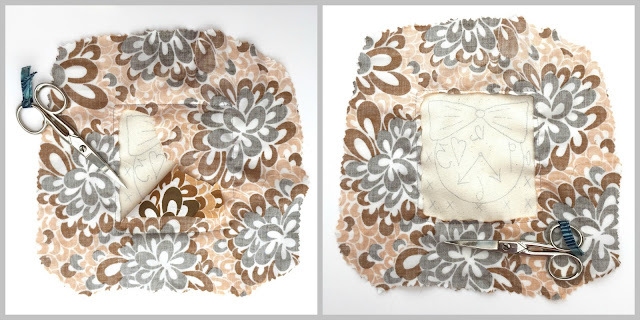 I then pinned the embroidery square into the centre and stitched it 1/8" from the square's edge. I also zig-zagged all my embroidery square raw edges before sewing them on as they fray very easily. Next, pull the back and front apart so there is a gap between the scrap fabric and the embroidery, pinch the centre of the back and flip over so the wrong side of the back is facing you. Keeping the fabric lifted, make a small snip into the centre of the back, making sure you are only cutting through one layer. Use the snip as an entry point for the scissors and carefully trim the backing fabric until it is around 1/4" from the stitching and you can see all the design peeping through. The little embroidery square is ready for a hoop! I've felt pretty flat since the start of the year, but today I felt a small shift, the days are a feeling a little longer, I saw a rush of orangey yellow crocuses popping up around two large trees and Lottie (our dog) has shown a little energy too. She's an older dog these days and loves to sleep, sleep and more sleep, but in the last couple of days, she's had a few moments of skittish giddiness when the sun has shone. Bring on Spring! Sarah Jane for Michael Miller, Unicorn Forest, Magic Knit. Popular print in 100% cotton jersey fabric, ideal for young children/baby clothes or grown up unicorn lovers. The Two Stitchers patterns are a great starting point. Carolyn Friedlander, Gleaned, Robert Kaufman fabrics: a stunning selection from Carolyn's new nature-inspired collection. I love the two snake prints in Ash and Cantaloupe. Also available as a roll-up jelly roll. Chambray with quotes motif from Robert Kaufman. I love making garments in chambray and this lends itself to many different styles. Fat Quarter Bundle: Makower Kity, 10 fabrics. Happy colours and cats galore! 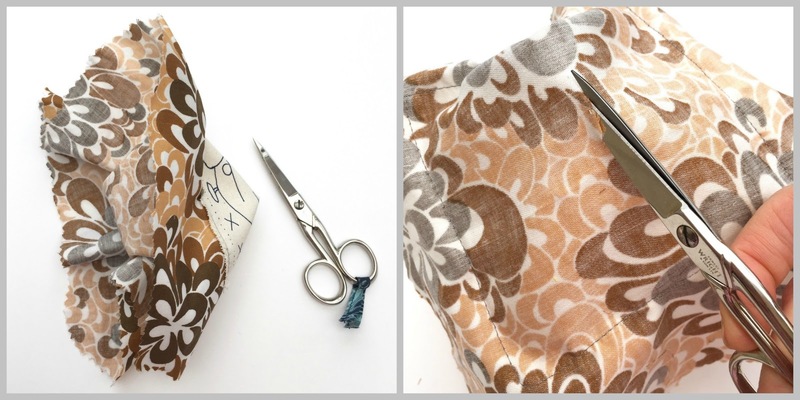 Fat Quarter Bundle: Makower Katie Jane 20 fabrics. An amazing 1930s repro/vintage bundle with lots of florals and feedsack style prints- unsurprisingly, this would be my dream bundle. I especially like the pink and navy prints. Fat Quarter Bundle: Fruity Friends, 13 Fabrics. Kawaii style designs and an eclectic mix of fruit, flamingos, florals and cacti. Prints can also be bought individually so you can make your own bundle. Printed cotton denim: Cherries. Wide width at 60" and lightweight so perfect for dresses and skirts. Art Gallery Jersey: from top to bottom: Arizona, Spices Fusion, Lambkin, Esoterra, Boho Fusion, Nightfall. My favourite is the Lambkin moon and starts print, it is practically begging me to become jersey pyjamas. Dear Stella, Jetsetter, Mermaid Jetsetter in Pine. There are four prints in stock from the Jetsetter range, all are very cute and lend themselves very well to EPP fussy cutting. Shirting rather than quilting cotton so suitable for clothing too. January is always a tough month, but previous years make me extra aware to take some measures to keep my mood from dipping too low. A funeral and the fall out from my granny's death are taking a toll too so I'm working extra hard to look for the positive. I found this photo at her house last week and I already had her heart locket. 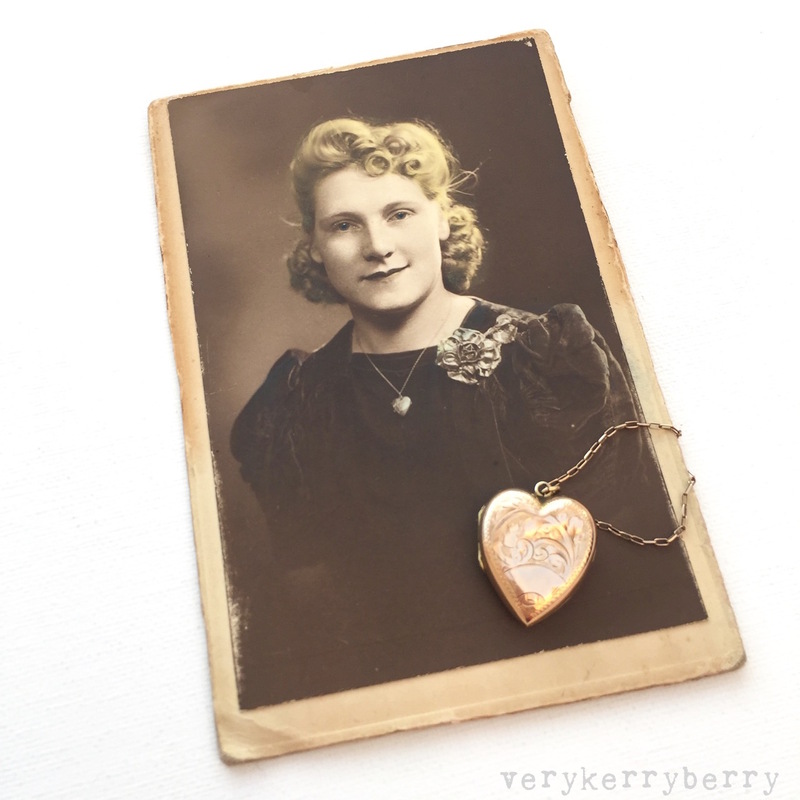 It's fragile with age, dented 'rolled gold' but inside is a tiny photo of her and I remember her wearing it all through my life. I wonder if it was an eighteenth or twenty-first birthday present and that's also why she had her photo taken. I've a new daily ritual based on Year of Wonder by Clemency Burton-Hill. 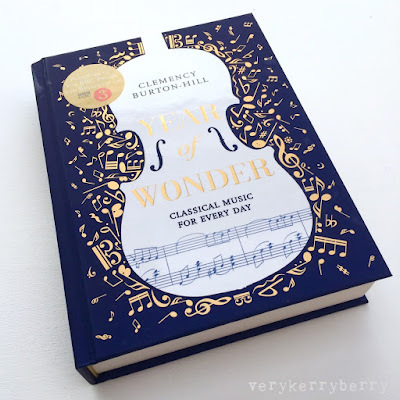 The book follows a calendar year and each day is a fresh musical suggestion and a page of background to the composer, style, genre, piece. I heard her being interviewed in November and it sounded like such a great way to expand my musical knowledge, plus her writing style is easy to read and her choices are lively and original. So far I've enjoyed each new piece, even if just to fit the music with day's writing. I listen as I eat my toast and tea first thing in the morning, before my usual email checking, and it is a delight, I cannot recommend it more highly for anyone who loves music. 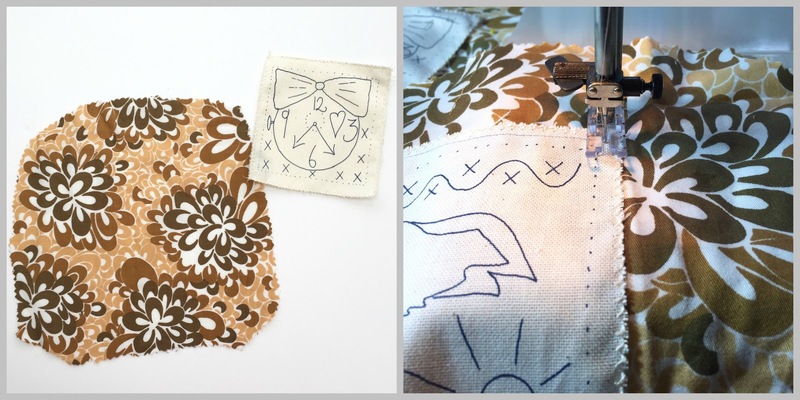 I've planned a couple of sewing projects that need a small regular commitment. 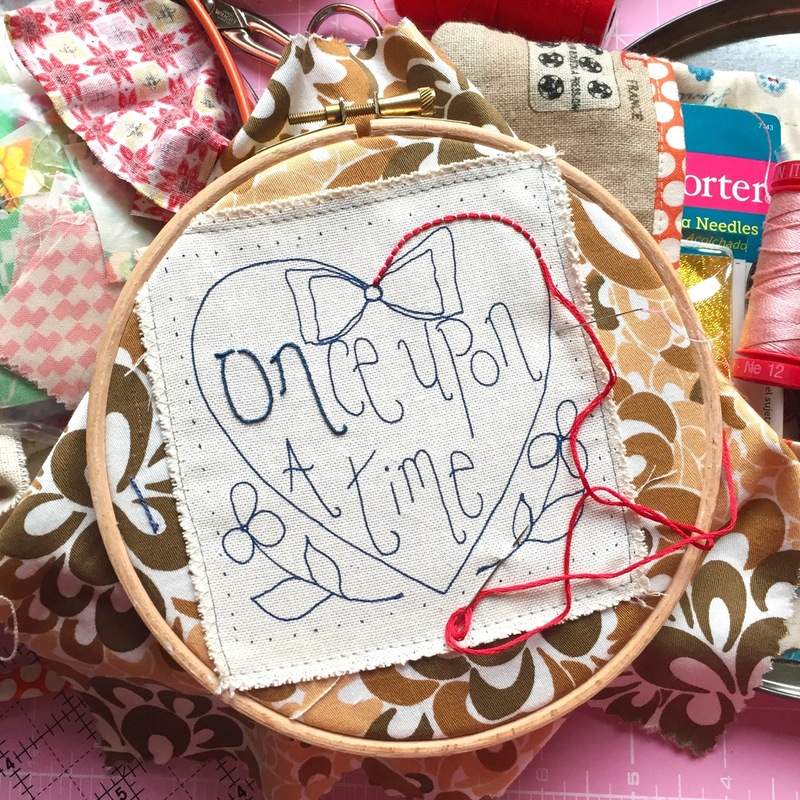 Firstly, I joined Sarah Fielke's Simple Folk BOM so I could concentrate on some hand appliqué alongside machine piecing and this kicks off with the first pattern PDFs at the end of January. So far, I've loosely planned a basic colour scheme for the frame and surrounding pieces and the nine-patches and motifs will be bright and scrappy. The other project I've chosen came from a chat with Helen at the first South West Modern Quilt Guild meeting of the year. We were talking about Jessie Chorley and she mentioned the Friendship Quilt Kit and it really appealed to me. 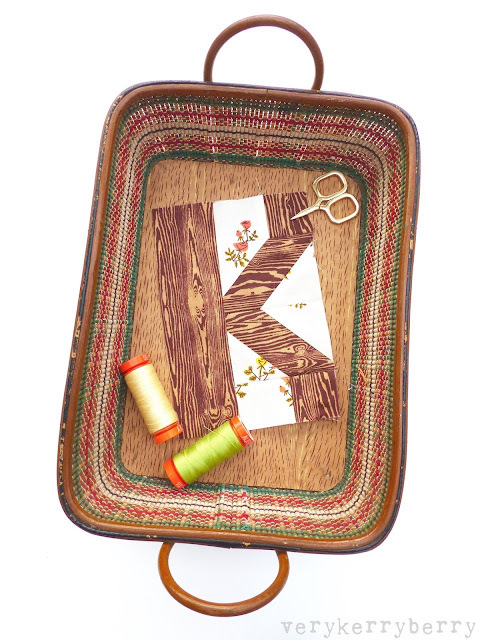 It's a small coverlet featuring embroidered panels and is personalised as desired by the maker. 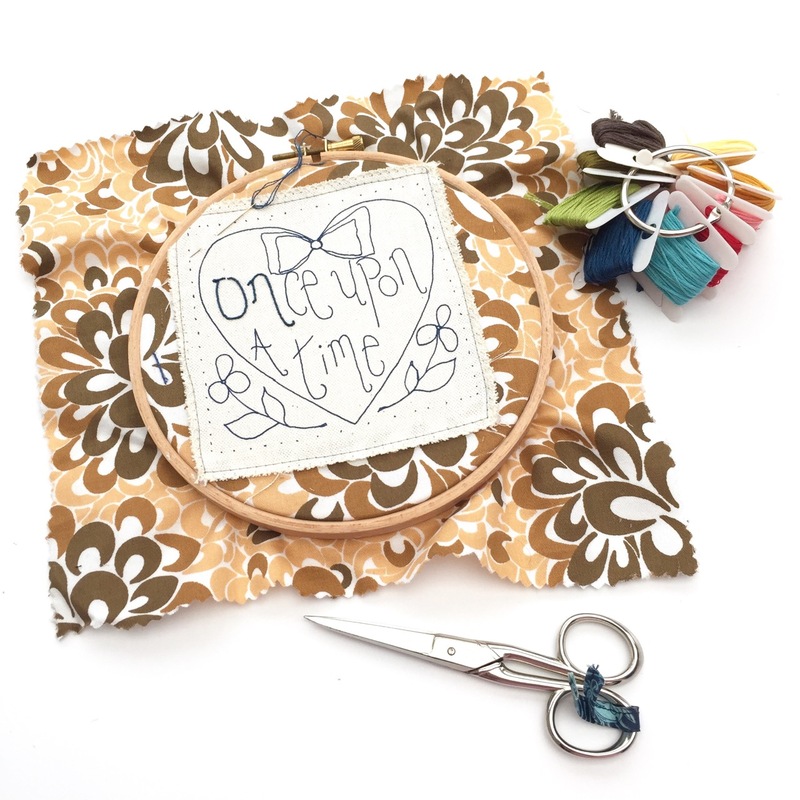 I wanted hand sewing based project to take to The Threadhouse retreat to stitch in the evening and I feel like celebrating the things I love in stitchy form so I am happily anticipating its arrival. I have clothing plans too but I'll save those for another post. Meanwhile, I'm self-medicating via large quantities of tea and coffee and toast and biscuits. All the blocks come from Lori Holt's Spelling Bee Book which contains all the instructions you need to make 100 blocks- upper and lower case letters, numbers, punctuation/symbols and picture designs. 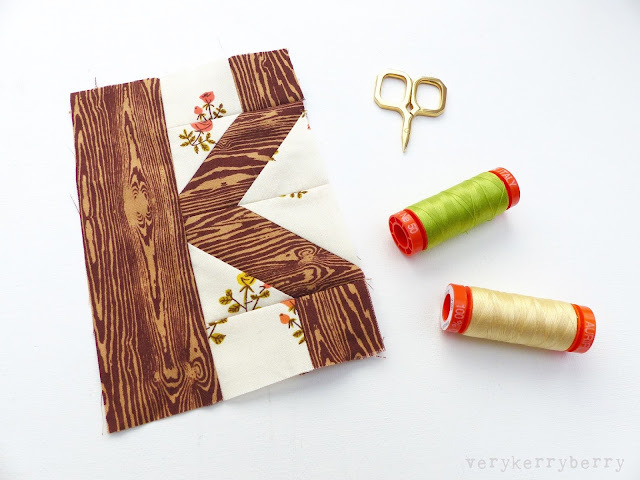 All the blocks come in two sizes (6" and 12") for projects of all sizes and there are setting suggestions for making your own quilts. The blocks are rotary cut and pieced, no foundation paper-piecing required and this block was a super fast make- mere minutes to cut and sew! 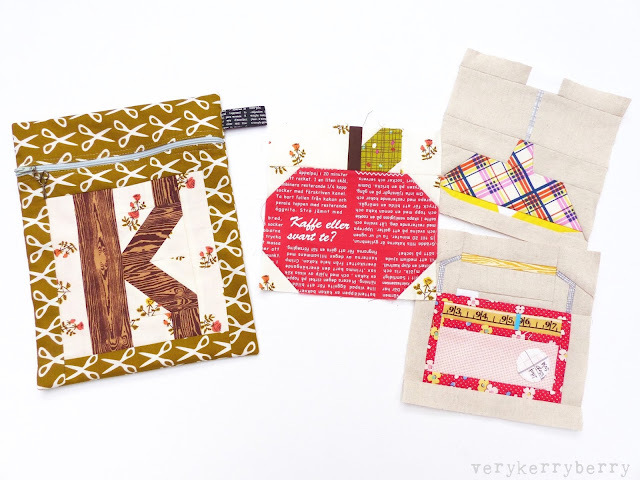 I'm mixing some Sew-Ichigo designs (lamp and radio) in with a selection of Lori's picture blocks like the apple block below- I have two more Spelling Bee picture blocks that will be revealed during my future stops during the sew along. My review of the Spelling Bee book is here where you'll also find links on where to buy the book.